The rise of printing and engraving led to the production of ribbons for political campaigns and commemorative events. Simple and straightforward, graphic appeal of the ribbon neatly fit the politics of personal association reflected by all manner of knick-knacks, household items, and specialty merchandise imprinted with a symbol or emblem. Some partisans were content to wear a ribbon. Quilter Abigail Ann Lane and her husband, William Bagley Lane, a Philadelphia engraver, acquired enough Whig and William Henry Harrison ribbons to sleep in. 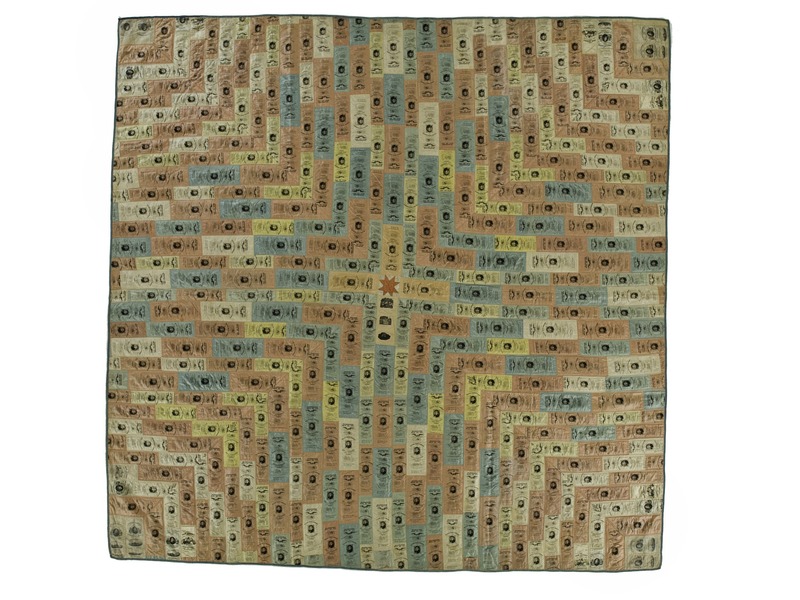 The quilt is composed of three different ribbon designs. The most prevalent ribbon commemorates Harrison’s inauguration as president in March 1841 and his death about a month later, a date printed near the bottom of the ribbon that was not part of the original engraving. The quilt is made of 432 ribbons stitched together and backed with plain white linen. According to family tradition, the Lanes acquired—or were left with—enough overstock ribbons for Mrs. Lane to assemble the quilt.